Truly a shame Duncan. What is a gorgeous pup like you to do?? You know what? You can now 'rent' paparazzi to follow you around and take your picture ~ I say raid your Mom's 'mad money' jar, and get that super model career goin'!! I must say, as far as I am concerned you look most handsome and spiffing in all your pictures. But what puzzles me is that you are quite the same colour as when you were a pup. Whereas my head has completely changed from black to russet, and my black saddle has altered its shape entirely over the past two years. Hi buddy, Duncan seriously, I don't think your mom can take a bad photo of you-you are just too handsome. Hunter is at the groomers so I'll try my hand at taking photos later. Oh Duncan, you were SO cute as a little puppy. No wonder you're so handsome now! Your mom couldn't ruin a photo of you if she tried! You are just so darn handsome, Duncan! Ohmigosh, you are SO CUTE, Duncan. 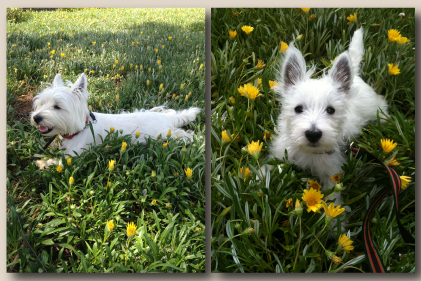 So cute in fact you remind of my Westie - Lily! I wish Lily would blog, but she's always far too busy terrierizing the neighbourhood (we live in rural England, and there are lots of critters out here that have to be kept in line). Lily says her favourite smell is the Chanel No.5 of the doggy world, fox poo and asks what yours is - she says wouldn't mind sniffing your bum someday, you are pretty cute! Lots of luff to you. ﻿michael kors hamilton tote outlet on sale online sleeping quarters! although walking from the catering, i used to flabbergasted always have a unique devote my midst, drinking found As normal as they need.